Las Palmas De Gran Canaria passenger and car ferry ticket prices, timetables, ticket reservations and information for ferries sailing from Las Palmas De Gran Canaria to Arrecife, Cadiz, Puerto Rosario and Sta Cruz de la Palma. Compare all available Las Palmas De Gran Canaria ferry ticket prices in real time and book the cheapest available Las Palmas De Gran Canaria car and passenger ferry tickets sailing to and from Las Palmas De Gran Canaria, Arrecife, Cadiz, Puerto Rosario and Sta Cruz de la Palma with Acciona Ferry Line ferries online with instant confirmation. Book Las Palmas De Gran Canaria Ferry Tickets with Acciona Ferry Line for ferries sailing from Las Palmas De Gran Canaria to Arrecife, Cadiz, Puerto Rosario and Sta Cruz de la Palma online in advance to enjoy the cheapest available ferry ticket price. The price you see is the price you pay. There are no hidden extras or surprises such as added fuel surcharges or booking fees and we do not charge you anything extra for paying with a Visa Electron card. The price we quote you for your selected Las Palmas De Gran Canaria passenger or car ferry ticket, onboard accommodation and vehicle type is all you will pay, and that's a promise. To obtain a Las Palmas De Gran Canaria ferry ticket price and book your ferry ticket securely online please use the real time ferry booking form on the left. You are also able to add a hotel at your destination, or anywhere else, to your ferry ticket when completing your ferry ticket reservation. Las Palmas is the largest city and the capital of Gran Canaria at the same time. It is situated in the north-eastern part of the island, in direct vicinity of Atlantic Ocean, between two charming bays and beautiful beaches there created: Playa de las Canteras and Playa de las Alcaravaneras. Las Palmas because of its privileged location ensure perfect connections to neighbouring islands, and Europe and Africa. To situated here Puerto de la Luz - the largest and most important port of the island, daily arrive huge carriers with deliveries of fresh food and others essential products, and once a week arrives ferry from Cadiz (Transmediterranea), bringing here mainly new tourists. Equally easy is to get here from the airport Aeropuerto Gando, which is located just 20 km south of the capital. In the main city there are two bus stations (Estación de Guaguas): one at Parque San Telmo and the second at Parque Santa Catalina. Thanks to them you can get practically everywhere. The green buses, called Guaguas, takes you to the other parts of the island, while those yellow (Guaguas Municipales) help you to navigate across Las Palmas. On 24th June, 1478 the city was founded by Juan Rejon, who was the head of the Castilian Army. The Army invaded the aboriginal people of the Canaries, a simple tribe known as Guanches, and impelled them to change their names to Spanish and convert to Catholicism. The people who were captured and would not conform to the new requirements were sold off as slaves in Valencia and Seville. Others fled to the mountains and made homes in the caves, many of whom still choose to live in the caves today, although they do not live quite such basic lives, having all the mod cons of plasma screen televisions and microwaves! The latest recorded population of Las Palmas is approximately 377,000 which is just under half of the total population of Gran Canaria. In 1492 Christopher Columbus sailed into the port during his first trip to the Americas and then again on his way back to mainland Spain and the city boasts a museum named after the place where he spent the night, the Casa Columbus, located in the Vegueta district. Vegueta is still thriving as the city's historic area and is the home to many museums and monuments such as the Chapel of San Antonio Abad, the Atlantic Centre of Modern Art, the Cathedral, the Episcopal Palace and the Canary Museum to name but a few. If shopping is what you do best, the neighbouring area of Triana should definitely be on the list of places to go. With it's pedestrianised maze of streets full of boutique style shops you can 'shop 'til you drop', but when you need refreshments make sure you stop at one of the street cafes for drinks and tapas before setting off again. If you prefer to do all your shopping under one roof, then visit Las Arenas Shopping Centre which is full of famous brand name shops. Head for Avenida Mesa y Lopez in the Santa Catalina district where you will find Spain's leading department store, El Corte Ingles, along with some familiar UK stores such as Marks and Spencer. Many of the local tour operators run air-conditioned coach services, dropping you off and picking you up within these three main areas. There are several beach areas in Las Palmas, the main one being Las Canteras. The beachfront has a newly constructed promenade housing many bars and restaurants all with spectacular sea views and offering a multitude of mouthwatering Spanish and international food-fare. The sand is of the fine variety and the waters are shallow making for perfect sun worshipping and safe swimming. The second longest beach in Las Palmas is Playa de Las Alcaravaneras which is flanked at both ends by sailing clubs, sailing being a popular pastime in Gran Canaria. Las Palmas as a beach resort is used mainly by the locals and people from mainland Spain. There are several medium sized hotels and apartments both at the beach and within the city itself. Foreigners tend to concentrate in the resorts in the south of the island. There are theatres too many to mention individually in Las Palmas presenting all kinds of shows including live music concerts, musicals, comedy and dance. The area around Parque Santa Catalina comes alive with music and street artists from early evening right through to the early hours where every member of the family can be found, from sleeping infants to reminiscing grannies! A highlight of Canary life at the beginning of each year is when Las Palmas hosts the fabulous Carnival. This is the most amazing exhibition of exuberant colour and entertainment where nearly everyone dons fancy dress costumes. The main events start in the pedestrianised area of Parque Santa Catalina set up with a massive stage for the dancers and various acts. The Drag Queen final is held during the carnival taking us back a few years with platform soles anything from ten to thirty inches high. Its only at Las Palmas Carnival you will see a mermaid dancing on stilts! Following on from the show the street parties start where the revellers continue throughout the next two or three days. The atmosphere is electric so if you are lucky enough to visit Gran Canaria early in the year, get out your glittery wig and join in with the fun. Best Price Guarantee - We always offer you our lowest available Acciona Ferry Line passenger and car ferries ticket price to and from Las Palmas De Gran Canaria. There are no hidden extras or surprises such as added fuel surcharges or booking fees and we also we do not charge you anything extra for paying with a Visa Electron card. The price we quote for your selected Las Palmas De Gran Canaria ferry ticket, onboard accommodation and vehicle type is all you will pay, and that's a promise! In the unlikely event you find the same all inclusive Las Palmas De Gran Canaria ferry ticket cheaper in the brochure of any other tour operator we promise that we will do our best to beat that price or offer you the choice of requesting a refund. 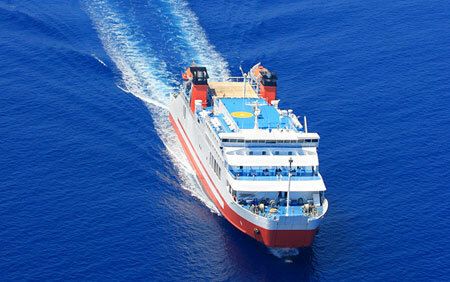 To book Las Palmas De Gran Canaria car and passenger ferry tickets please click here. At ferryto.com you are able to obtain live Las Palmas De Gran Canaria ferry ticket prices, check availability and book car and passenger ferry tickets to and from Las Palmas De Gran Canaria at our lowest available ticket price. Ferryto.com is part of the world's largest online ferry ticket distribution network providing the ability to book over 80 major European ferry operators including to Las Palmas De Gran Canaria and to over 1,200 other ferry routes throughout the UK, France, Spain, Ireland, Holland, Eastern Europe, the Mediterranean, the Baltic and North Africa.